As the result of the Survey’s 2010 – 2012 National Endowment of Humanities (NEH) grant for investigations at the Carden Bottoms site (3YE25), Dr. Leslie Walker and Jerry Hilliard are currently examining the relationship of features and associated artifacts that were excavated from three houses. These houses were occupied by Native American people who lived around 1600 A.D. in a large settlement located below Petit Jean Mountain in the Arkansas River Valley. In addition to discovering remains of cooking vessels, evidence of pottery making, use of bone tools and personal items, we found evidence of stone tool production and tool maintenance, pigment processing, and storage of various goods. This study is possible only because excavations were very carefully planned and executed. In addition to exacting trowel work and ample sampling of soil matrix, individual artifacts were point-plotted using an electronic total station, capable of sub-centimeter accuracy both in area (X Y coordinates) and elevation. These methods allow us to examine the architectural features, associated tools and other remains, as well as the relationships between interior house features such as the hearth, posts, walls, interior partitions, the house floor, loft and roof. Objects were found that were clearly “above the house floor” as well as “on the house floor.” The “above floor” objects were in the lofts of these large (ca 8m square) dwellings or on benches located against the interior walls. The “house floor” objects; on the other hand, were found below those “above floor” artifacts and situated around the central hearth on the floor itself. Madison arrow points, top row; Nodena arrow points, bottom row; all found on the floor of House 2. As an example, stone arrow points both of the triangular type Madison as well as the willow leaf type Nodena were found inside the houses. Stone tools and tool debris, including small river pebble or cobble cores, preforms, flakes, and thumbnail scrapers were also found in small clusters. The variety and type of chipped stone tools and the tool making kits, in addition to tool debris, indicate stone tools were not only maintained within the houses, but also manufactured. 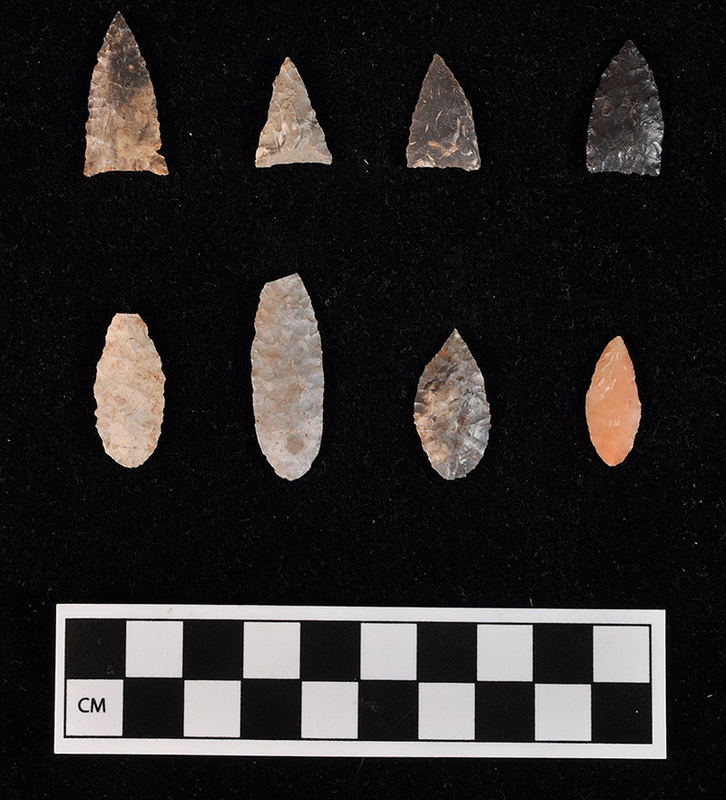 The overwhelming majority of tools and chipped debris were made from Ozark cherts that occur locally as river pebbles or small cobbles, having washed into the Arkansas River Valley over the millennia. Novaculite tools were also used, but these are far less common than the Ozark chert sources which could have been collected in the river gravels locally. 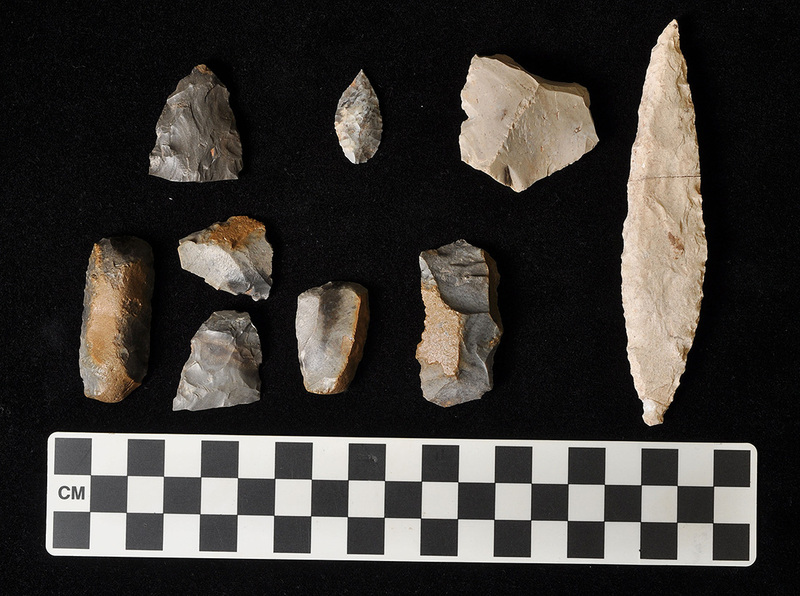 Tools and flakes from Alibates and other “exotic” chert such as Flint Hills, were also found in very small numbers. These chert formations do not occur locally, but have washed in cobble or pebble form from their places of origin in the southern Plains, eventually making their way east to the Carden Bottoms locale over thousands of years. Assorted stone tools found in association on the floor of House 2. Leslie Walker, project archeologist during our excavations, completed her dissertation Liminal River: Art, Agency and Cultural Transformation Along the Protohistoric Arkansas River in 2014 at the University of Arkansas. Dr. Walker is the Museum Coordinator, Instructor of Archaeology and Museum Studies at Linfield College in Oregon. Jerry Hilliard, who also served as a project archeologist, has been analyzing all of the excavated materials from Carden Bottoms. Those artifacts include excavations from 1991 – 2009 directed by Dr. Skip Stewart-Abernathy, former WRI Station Archeologist. Dr. George Sabo, current Survey Director, spearheaded the NEH grant, served as overall director of the project, and is planning for an edited book volume. Dr. Jami Lockhart, the Survey Director of Archaeogeophysical and GIS Applications, conducted remote sensing at the site and served as a co-Principal Investigator. Dr. Tom Green, Survey Director during the NEH grant (now retired), coordinated various meetings between participants and supported the project in a variety of ways, including assisting in excavations for a few days. Dr. Ann Early, State Archeologist, also participated in the project, examining artifacts dug years ago that are now located in various museums around the country. All of the above persons, in addition to Walker and Hilliard, presented papers on the NEH project at the 2012 Society for American Archaeology Annual Meetings in Memphis. Rebecca Wiewel conducted instrumental neutron activation analysis INAA of ceramics from Carden Bottoms as part of her dissertation research at the University of Arkansas. Rebecca’s dissertation was completed in 2014 and is entitled Constructing Community in the Central Arkansas River Valley: Ceramic Compositional Analysis and Collaborative Archaeology. Dr. Wiewel is now an Assistant Professor of Anthropology at Arkansas Tech University. Our colleagues from the Oklahoma Archeological Survey Dr. Scott Hammerstedt and Dr. Amanda Regnier assisted Dr. Lockhart in the remote sensing phase of the project and participated in excavations. John Riggs, archeologist with the Natural Resources Conservation Service, also assisted in the project and worked with the landowners in their endeavor to plant trees on the site to make it a hunting preserve. The landowners, members of a local hunting club, were very supportive throughout the entire project. Jared Pebworth, Mike Evans, Aden Jenkins and Larry Porter served faithfully as Survey field archeologists during our 18 weeks of excavations between 2010 and 2012. On occasion we were assisted by additional Survey personnel including Michelle Rathgaber and Marion Haynes of the Blytheville Station, Dr. Liz Horton of the Toltec Station, Tim Mulvihill, UAFS Station Archeologist, and Fayetteville crew members Teka McGlothlin and David Halperin. A number of Arkansas Archeological Society members assisted us during fieldwork, notably Jim Rees, Paul Knapp, Don Higgins, Alan Smith and Susan Poznar, all who worked numerous days. As part of the grant, representatives of the Osage, Quapaw and Caddo nations also assisted in all phases of the project. Dr. Andrea Hunter, Tribal Historic Preservation Officer for the Osage Nation, served as a co-Principal Investigator. Representatives of all three tribes contributed in a follow-up meeting about the project at WRI upon conclusion of field investigations. Integration of the Native American perspective is one of many goals for the continuing Carden Bottoms findings.